Music for wind instruments, in modern performance practice that is either music for cornetts and sackbuts in repertoire of the renaissance and the early 17th century, or Harmoniemusik, which was frequently written in the classical period. It seems that wind music from the late 17th and early 18th centuries is largely neglected. 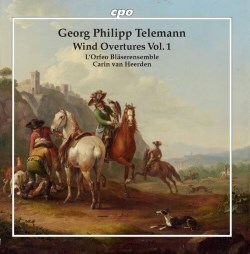 The present disc is the first volume of a series of recordings with the complete music for wind band from the pen of Georg Philipp Telemann. These five pieces are for the same scoring of two oboes, two horns and bassoon. The emergence of the oboe in particular was a key moment in music history. Louis XIV employed a group of twelve oboists, called Les Douze Grands Hautbois. As everything French exerted a strong attraction on royalty and aristocracy across Europe oboes - mostly alongside bassoons - appeared in court chapels outside France. The horn, on the other hand, was very much a German/Austrian addition to the wind band. Its history goes back to the Middle Ages, but technical changes in the early decades of the 18th century allowed it to play an increasingly important role at royal and aristocratic courts. From ancient times the horn was associated with the hunt, and in the 18th century it was naturally associated with kings and aristocrats, given that hunting was one of their main preoccupations. Telemann's music for wind band could either be played outdoors or in the private rooms of aristocrats. In the latter case it seems likely that the bassoon, playing the basso continuo, was joined by a chordal instrument, such as the harpsichord. In such cases the oboes could also be replaced by violins. A copy of the Overture in F (TWV 44,8), which is part of the library of the court chapel of Darmstadt, explicitly mentions oboes and violins as alternatives. Moreover, the oboe parts could also be played on oboi d'amore; in that case these parts needed to be transposed. Four of the five pieces included here are overtures, the counterpart of the many overtures or orchestral suites Telemann composed. They open with an ouverture in binary form (ABA); in these performances the dacapo of the A section is followed by a repeat of the B section and closes with a third exposition of the A section. The latter has the dotted rhythms, which are characteristic of the French overture. The exception is the Ouverture in D, which has a strongly pastoral character. The overture omits dotted rhythms; the second section is a fugue. The pastoral nature of this piece is confirmed by the third movement, called Les Paysans (the farmers). Character pieces also appear in other overtures, such as the Ouverture in F (TWV 44,16), whose second movement is called Les Ris (the laughter) and the third Les Droles (the droll company). These two movements are examples of Telemann's skills in musical characterisation. The Ouverture in F (TWV 44,8) focuses on the hunt. The second movement is called La Chasse, and obviously the two horns play a major role here. The Concerto in D is an entirely different piece, despite the similarity in scoring. It is in four movements, according to the concerto form Telemann mostly preferred, rooted in the sonata da chiesa. It is another piece with a pastoral character. Its authenticity is not beyond any doubt, but according to Telemann scholar Wolfgang Hirschmann, in his liner-notes, "it shares some thematic and stylistic elements with the well-known Concerto for Two Oboi d'Amore, Strings and Basso Continuo in A major (TWV 52:A1)". It is not known for sure when Telemann composed the music for wind band. However, the Darmstadt copy of the Ouverture in F, mentioned above, dates from the period 1714-1716, when Telemann worked in Frankfurt. Here he had a band of six oboists at his disposal and he also could rely on the court chapel of nearby Darmstadt, where his friend Christoph Graupner was Kapellmeister, and which had some excellent wind players in its ranks. The other pieces may well date from the same time. One thing is for sure: Telemann required considerable skills from the interpreters, and the performances by the wind players of L'Orfeo Barockorchester leave nothing to be desired. These are technically immaculate accounts of these five pieces, and the players deliver engaging performances, showing the qualities of Telemann's compositions to the full. This is a delighful disc, which no Telemann lover, nor any lover of wind music, should miss. I am eagerly looking forward to the next recording of Telemann's music for wind band.